Since I returned from Haiti, I have written to friends, relatives, those who are involved in humanitarian projects to finds ways to help kids living in orphanages, in poverty, or live without proper care. I have been overwhelmed by how generously individual and companies have stepped forward to donate, and to guide me through. I am asking you to do the same, and get involved. GET INVOLVED TODAY. We need to build a medical clinic in Haiti, land and medical equipment has already been donated. To build this clinic in Haiti, we must raise $75,000. This clinic will provide basic-urgent medical care to the kids who are living in the orphanages, will assist those who live in nearby villages who have no basic health care of any kind, and will prevent spread of diseases and death by Malaria and Cholera. FOR EVERY DONATION OF ANY DENOMINATION, WE WILL DONATE A PAIR OF SHOES. YOU WILL ALSO RECEIVE A GIFT OR A GIFT CERTIFICATE FOR YOUR GENEROSITY. I just posted pictures of our trip in Haiti in our Photo Blog, which is on the left side bar. Overall, I had a great time at Haiti and it is one of those trips that I will remember forever. Our trip was through an organization called Global Family Philanthropy, and the orphanage we were at was in Les Cayes which is a four hour drive from Port-au-Prince. Our job was to build a chicken coop and we had a great deal of time to play with the kids. Since our group was small, we really had the opportunity to bond with the kids. The kids were always happy to see us and always wanted us to play with them and give them our love and care. They always wanted me to pick them up and hold them, because they loved that feeling to be held and known that someone actually cares for them. Some of the older kids knew that we were not going to be there for long, so by about 3 days prior to leaving, they were sad, because they knew we were leaving soon but didn't know exactly when we were leaving. The last day was the most emotional day of the trip, because that was when almost everyone knew we were leaving. Some starting crying and some were too upset to do anything. They were sad because they knew that they can't receive the love and care that we gave them during the 10 days. It's as if telling them that the love and care that we are giving them is temporary. It's sad because I realized that kids always need unconditional and undivided love and being there for such a short time was telling them that they can't have the unconditional love that a parent can give them. However, my heart is still with them and they were great kids and were always smiling and laughing, which made me smile and laugh as well. Haiti is a country with great people and the countryside is beautiful, especially the beaches. The only problem is their management. For example, there is an abundance of banana trees, almond trees, and avocado trees, but the people are still starving. There are no garbage cans there so you see piles and piles of trash in the middle of the streets. When you drive from Les Cayes to the capital, it's all the same thing. It's just poor villages after another and garbage and filth everywhere. They have an abundance of resources, but they just have poor management. The reason I am so shocked here in US is because it is so clean compared to Haiti. I dont have to use my hand sanitizer every 5 minutes and can actually walk barefoot in my own room, whereas we couldnt in our hotel room. I am still recuperating because of the culture shock. Just to let you all know, I have already bought tickets to volunteer at Haiti from June 8 - 19. Haiti is the poorest country in the western hemisphere. Ever since the devastating earthquake in 2010, the amount of poverty, jobless and hungry people, and spread of cholera has risen. I also want to shift my direction as to where to donate. The people in Haiti need much help and I will go there to volunteer at an orphanage, so I can tell you about their living conditions and what they need help the most. I am planning on keeping a daily journal when I go there, and will share it to all of you when I get back. Also, I am planning on making a documentary as well, since honestly, not many people have made documentaries about Haiti after the earthquake. The trip I am going to is supported by Global Family Philanthropy. To learn more about volunteering and donating to Haiti, click on their site to learn more. A few weeks ago, while I was in Berkeley, Ca., I came across a store that had a flag of Japan on the display window on the corner of Telegraph Avenue & Park Street. As I went in, I realized that the store was set up like a bazaar. The Japanese community of Berkeley were selling their goods and valuables, such as crafts, hats, jewelries, clothes, shoes, and books, away to raise funds for Japan. I was very inspired by this, and that is how I had the idea of donating our proceeds from the TOMS Event a couple weeks ago to Japan Relief. The store has its own website that tells you directly where to donate for Japan relief. All proceeds will go to the Japan Red Cross Society. Click here to donate and make a difference. YAP has joined forces with Shoebiz and Onitsuka Tiger to bring awareness about the Japan earthquake and tsunami. Our goal is to raise money to help kids who lost their parents and families during the devastation. Help us to spread the word and if you want to help, just send me an email at shawnesmaili@gmail.com, and I will guide you to reliable organizations where you can safely send your donations. To find out more, you can also go to shoebizsf.com and hypebeast.com. I would like to thank everyone for participating at the event. Overall, we sold and customized 72 pairs of TOMS Shoes, which means that we are giving 144 pairs of TOMS Shoes to the victims in Japan. Below are pictures of the event. To view more pictures of the event, visit our Facebook page. Thanks again for participating. You guys have made a big difference. For every pair of TOMS sold, TOMS will give a pair of shoes to a child in need and Shoebiz will donate two pairs to the Japan Earthquake Relief Fund. Come and get your TOMS shoes painted by local bay area artists. Mapendo International gives humanitarian assistance to those who have been affected by war and conflict. Their main mission is to create a safety net for people in Africa who are fleeing violence, whose lives are at risk, and who have no access to humanitarian aid. Right now, there are nearly 3 million refugees across Africa who have fled their homes due to violent conflict and persecution. Less than half of those refugees are served. Click here to join the cause in order to help rescue and protect the refugees in Africa. I want to thank everyone who participated in the event by buying TOMS shoes. Now we are able to give 197 pairs of shoes to orphans and children in need. TOMS shoes will match every shoe sold to a child in need and Youth Against Poverty will give every money raised to the orphanages and organizations that we support. 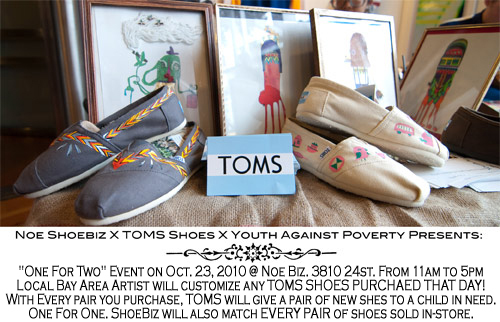 Local Bay Area Artists will customize Toms Shoes Purhcased that day for Free. Shoebiz will match dollar for dollar for every shoe they sell to Youth Against Poverty. We will use that money to donate to the orphanages and organizations that we support. Also, with every pair of Toms Shoes sold, Toms will give a pair of new shoes to a child in need. The Jatukik Providence Foundation is a non-profit organization in Congo that focuses on improving the lives of 400 Congolese orphans who are victims of war and disease. Their goal is to continue to better the life of the orphans in the oppressed communities by providing education, food, clean water, and medical supplies . Did you know that if you add the deaths in Darfur, Iraq, Afghanistan, Bosnia and Rwanda of 1994, they WOULD NOT equal the millions of deaths in Congo? These orphans need help because Congo is the deadliest conflict in the world since WWII. Stand Proud provides braces and surgeries to children and adolescents who are victims of polio, accidents and/or other diseases that result in leg and foot deformities, mainly concentrated in the Democratic Republic of Congo. Handicapped in Congo are despised and often accused of being filled with evil spirits. Even parents sometimes believe their children are cursed or being punished for some unknown evil. Getting braces and being able to walk opens new doors. Walking doesn't always solve all problems; many people are still cruel to the handicapped. But when they can walk and get around with dignity, they have a good chance at improving their lives. One of the big expenses for this organization is school fees for the beneficiaries. Some of these kids weren't able to attend school before they got braces, and others needed to stay up to date with classes while they are in rehabilitation. To learn more about Stand Proud, click here. YAP is giving away complimentary tickets to the premier movie Step Up in 3D on Wednesday, August 4 at 7:30 PM located at 845 Market Street, 5th Floor, San Francisco. After you have joined our Facebook and Twitter pages, email me at shawnesmaili@gmail.com and I will mail you the tickets. We only have 20 tickets. We are in planning stages to have a fundraising event in San Francisco (1553 Haight Street) on August 13-14. We are displaying creative art by Wendy McNaughton with generous support of Onitsuka Tiger/Asics to raise funds and awareness for orphanages across the world. The art event will coincide with Outside Land Music Festival. I am asking everyone to join us and support our cause, purchase art, and Shoebiz and Onitsuka will match dollar for dollar with all the purchases that we make. In addition, Shoebiz and Onitsuka Tiger will match every dollar you donate to Youth Against Poverty. 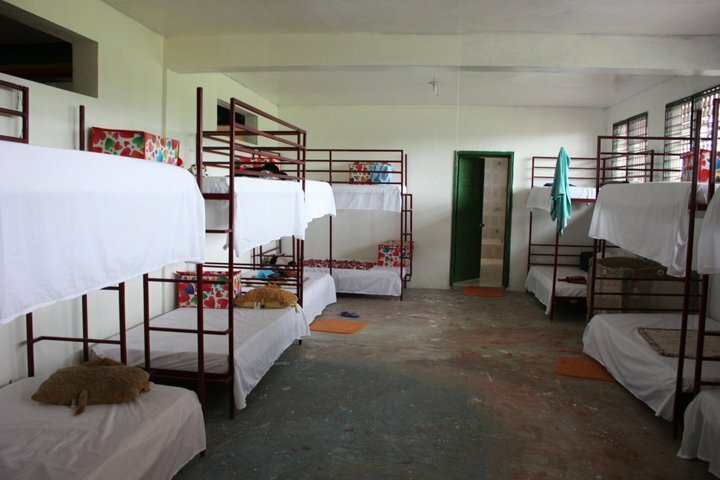 I have to emphasize, YAP does not collect money, we provide money to youth and orphans in need. I will be at the event, so if you have any questions, comments, etc, please feel free to talk to me about it.